Dear JCPS Ready4K! Presents Ready Texts: Text messages to boost your child’s learning. Ready4K! 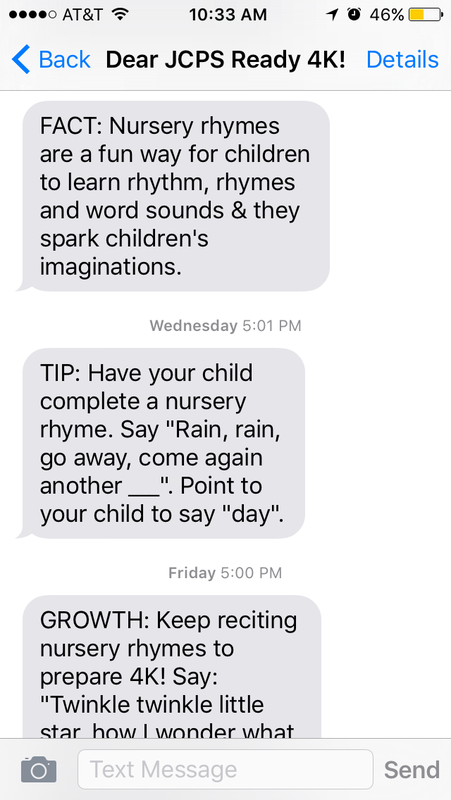 text messages include FUN FACTS and EASY TIPS to help you prepare your child for kindergarten. You can choose to stop receiving texts at any time by replying STOP to any message. Fill out the form below start receiving Ready4K! texts in Fall of 2016. Please provide your email address if you would like to also receive important email updates. As of Fall 2016, please indicate the appropriate category(ies) for all the children in your household. Hold down the CTRL key to select more than one. By the start of the 2016-17 school year, we will have a full range of programs for parents of 3-5 year olds available in English and Spanish. If you’re interested in learning about other ReadyTexts as they become available, please check the appropriate boxes of children's ages as of Fall 2016 above. The problem: The gap in parenting between rich and poor families is extreme. By the age of four, low-income children in the U.S. hear 30 million fewer words at home than high-income children (Hart & Risley, 1995). Such disparities have huge long-term consequences for individuals and society as a whole, given strong links between parental involvement, student achievement, and later life economic outcomes (Anderson, 2006; Heckman, 2006). To-date, few interventions have improved parenting, and those programs with some evidence of effectiveness are too costly to scale (Duncan, Ludwig & Magnuson, 2010). Many programs fail because they place significant demands on parents’ time and effort and inundate parents with information that is difficult to remember and put into practice. Typical parenting workshops, for example, suffer from turnout rates as low as 50 percent and dropout rates as high as 50 percent; and, parents who likely need the most support drop out with the highest frequency (Brotman et al., 2001; Miller & Pennucci, 2004). Given its widespread use, low cost, and ease of scalability, text messaging is the ideal vehicle for providing parents with small bits of helpful information. 97 percent of American adults under 50 have cell phones, 98 percent of cell phone owners can access texts, and text messages have a 95 percent open rate (Ehrlich, 2013; Zickuhr & Smith, 2012). Moreover, texting has proven efficacy in similar behavior change applications. A growing body of experimental research in healthcare shows that the frequent provision of well-designed texts can improve a wide range of health outcomes (Patrick et al., 2009; Petrie, Perry, Broadbent & Weinman, 2012; Rodgers et al., 2005; Yoon & Kim, 2008). In education, texting has led to improvements in grade point average and college matriculation rates (Bergman, 2014; Castleman and Page, 2013). Ready4K! Studies: During the 2013-14 school year, we conducted a randomized controlled trial study of Reay4K!, a ReadyTexts program for parents of four year olds focused on literacy. We found that the program increased parental involvement at home and school, ultimately leading to two to three months of child learning gains in literacy (York & Loeb, 2014). In a follow-up study, these effects persisted after parents received another year of texts (Doss, Fahle, Loeb & York, forthcoming). The results of this research have been highlighted in The New York Times, The Huffington Post, and Education Week. 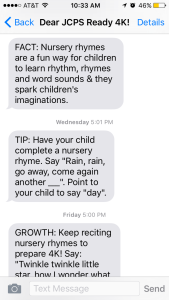 Expansion: In last year, ReadyTexts has expanded from serving 1,250 families in the San Francisco Bay Area to over 30,000 families in 22 states. In addition, we have developed math and social-emotional content for parents of four year olds as well as a literacy program for parents of kindergartners. By the start of the 2016-17 school year, we will have a full range of programs for parents of 3-5 year olds available in English and Spanish.